The reality for many patients, especially if they are arriving at A&E, is that they will be spending a significant amount of time in the waiting area. For this visitor, it might be their first experience of healthcare and they are very likely to be worried about themselves or a loved one. For staff and clinicians, working efficiently and keeping a calm and positive atmosphere is paramount. A few thoughtful and inexpensive changes can make a significant difference to the overall experience of any waiting area. The temptation is that ‘more information’ is a good thing and that a patient arriving will want to know as much as possible, straightaway. In fact, too much information makes already stressed individuals likely to ignore all the information and make no decision at all. Busy walls full of posters, cluttered notice boards or desks bulging with leaflets can be overwhelming. Start by taking away out of date or duplicated information and give space to the most important messages. Consider digital screens that can give up to date and relevant information, including waiting times where appropriate. Is it easy to find your way around? Take an objective look at your space, or ask your reception staff which wayfinding questions they are asked most often. For someone who does not know the hospital can they easily find the toilet, the cafe, the way out? Visitors may be in pain or confused and using clear visual indicators to the places they might want to go, could make them feel more relaxed and relieve some of the pressure on your staff. An example might be highlighting with colour doors that patients can use, and camouflaging doors that are staff only. Your reception staff and desk area are often your frontline in letting your clinicians work most effectively. 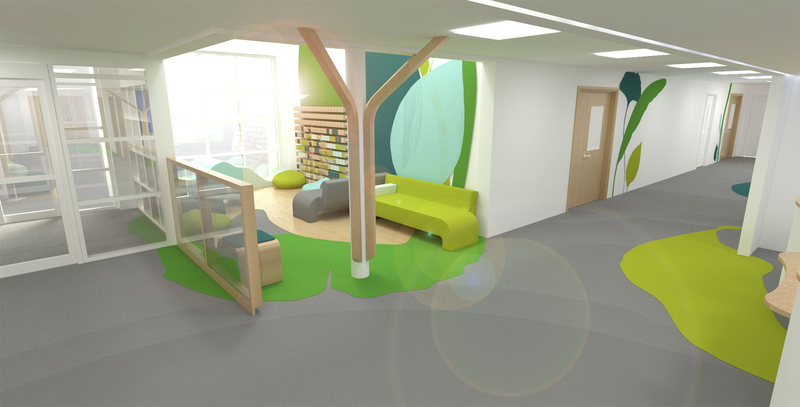 Providing an accessible desk, with a height suitable for wheelchair users, and good lighting to support visually and hearing impaired, should be the starting point. We often talk about ‘line of sight’ when planning out our designs, making sure that staff can clearly see into every corner of the waiting area. This brings multiple benefits – staff can easily see and respond appropriately to behaviour in the waiting room, and visitors feel they are visible not being ‘forgotten’. If you have a hidden part of your waiting room, think about installing mirrors to improve the view – studies show that people who are observed, or have the perception of observation, often behave in a socially more acceptable way. Natural light is always the best source of lighting to aim for, but not always possible in practice. If you do have windows, ensure they are clean and for the best part, uncovered by blinds. The full spectrum of daylight improves mood and healing times but where it is not available we have to do our best to emulate it. Ensure lighting levels are bright enough, that important areas such as high traffic areas, doorways and reception areas are especially well lit. Lighting vertical surfaces is preferable to downlighting as it gives a more homely feel. If it is appropriate, removing lighting covers in ceilings can give a more naturalistic effect. Our designs often incorporate purpose built, infection safe, fixed furniture. We cluster them together in informal groupings and offer different heights and widths to support family groups, individuals and accessibility needs. When looking at the waiting area you offer, can you make adjustments to the arrangement that would better support your visitors? Make space for pushchairs and wheelchairs. Do you offer smaller furniture designed for children or high backed furniture to support older or less able people? Can you group seating to offer a more intimate and friendly feel? Healthcare environments, with the need for cleanliness and infection control, consist of hard smooth sound reflective surfaces. Noise can and will travel easily and research is showing that the effects of unwanted noise are detrimental to health and healing times. If your waiting area suffers from excessive noise you could consider the installation of sound absorbing ceiling panels or pelmets, or even flooring. It is also possible to source sound absorbing privacy panels, which can be located anywhere. Plants placed in corners and along walls can also help. Positive distractions in waiting rooms have been shown to reduce pain and anxiety. The old fashioned doctor’s waiting room favourite of a fish tank was put there for a reason! Fish tanks or other visually stimulating distractions such as artwork, digital screen installations, use of colour and creative lighting can all have a positive effect. Children in particular respond to interactives that promote discovery, creativity and imagination. Blackboards and Lego walls are cost effective and compact installations that promote independent and group play. There is a direct correlation between ‘nature’ and a positive effect on well-being. Access to an outdoor garden space would be ideal, but often not practical. Research shows that even a picture of a nature scene of mountains, forests or oceans can reduce healing times and stress, and is more beneficial than other more abstract artwork. When choosing art and colour schemes for your waiting room, nature images and colour palettes are a good place to start.